Would you like to make your own unique lampshade to coordinate with your interiors? 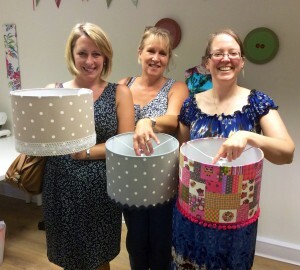 This workshop will give you the skills to make your own bespoke lampshade to display in your home. Additional costs: You will need to bring 1/2 metre of your chosen fabric or why not recycle some used fabric? Everything else is included in the price (a 30cm drum frame is supplied, as picture). We do have braids, tassels etc but if you want a particular colour please bring along (approx.1 metre). If you would like to buy additional lampshade kits we sell them for £14.00 each.